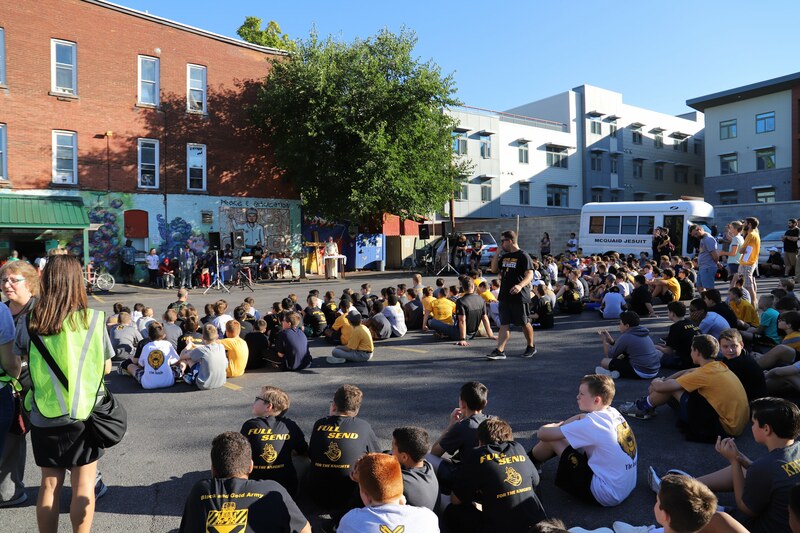 Part of McQuaid Jesuit’s mission is inspiring young men to “a life-long commitment to justice.” Driven by this mission we seek to make students aware of important social issues and how they can respond. We inform students of different types of injustices in the world and then the Ignatian response that encourages a faith that does justice. The heart of this work is to make sure the human dignity of all people is fully recognized. 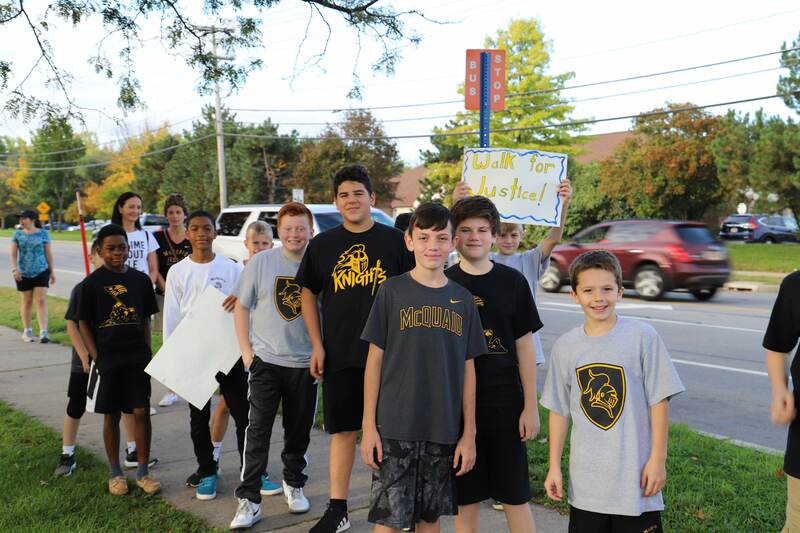 Below please check out some pictures from our most recent event, the Middle School Walk for Justice, that raises awareness about homelessness in our community. 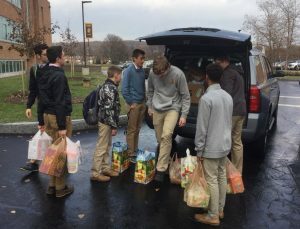 You will also find information about the on-campus groups that embody this important work and some of the events held at McQuaid Jesuit to highlight social injustices, educate students, and give back to the community. 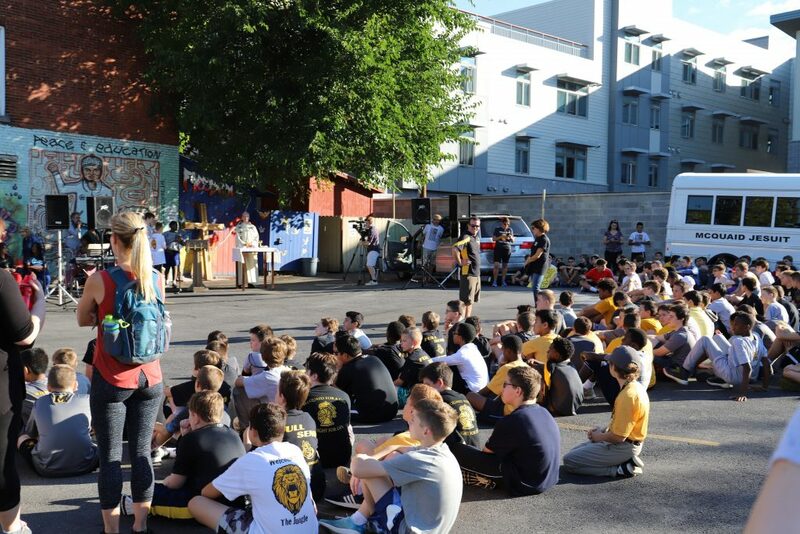 The McQuaid Jesuit Arrupe Society is intended to be the focal point for all student social justice activities. Father Arrupe famously challeneged Jesuit students to be “men and women for and with others.” Arrupe Societies, named in his honor, in secondary schools, colleges, and universities around the world have been formed to carry forward this message of Jesus. 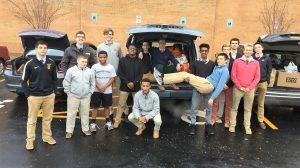 The Arrupe Society has sponsored outreach to men and women who have experienced homelessness, visits to the House of Mercy, St. Joseph’s House of Hospitality, and other activities. They currently manage a food cupboard through the school that provides donations to needy members of the Rochester community, specifically refugee families. For more information, contact Mr. Tom Greiner. This weekend trip is open to a limited number of McQuaid juniors and sophomores who are members of the Arrupe Society. The ISN Arrupe Leaders Summit invites emerging student leaders from Jesuit high schools and parishes nationwide to deepen their understanding of “a faith that does justice,” share ideas and resources for social justice programming, and become empowered to effect positive social change in their local and global communities. For more information, contact McQuaid Jesuit’s Director of Service and Justice, Mr. Patrick Flaherty. This weekend trip is open to a limited number of McQuaid Jesuit juniors and seniors. The Ignatian Teach-In for Justice is an annual gathering for members of the Ignatian family (Jesuit institutions and larger church) to come together in the context of social justice and solidarity to learn, reflect, pray, network, and advocate together. It is a place where people are empowered, re-energized, inspired, challenged, and supported by a community that sees faith and justice integrally linked. The conference is held annually in Arlington, VA, across the river from Washington, D.C.
Begun over 20 years ago, the IFTJ has a rich history rooted in honoring the Jesuits and their companions who were martyred in El Salvador in 1989. The weekend conference attracts a wide array of distinguished speakers such as Sr. Simone Campbell, SSS, Fr. James Martin, SJ, and Fr. Bryan Massingale to name a few. These speakers challenge students to become agents of change in their own communities. 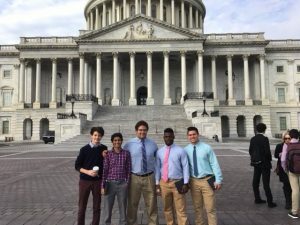 The conference ends on Monday with an advocacy day where students have the opportunity to meet directly with their legislative representatives on Capitol Hill. For more information or to attend the IFTJ, contact McQuaid Jesuit’s Director of Service and Justice, Mr. Patrick Flaherty. You can also learn more by going to the IFTJ’s website. 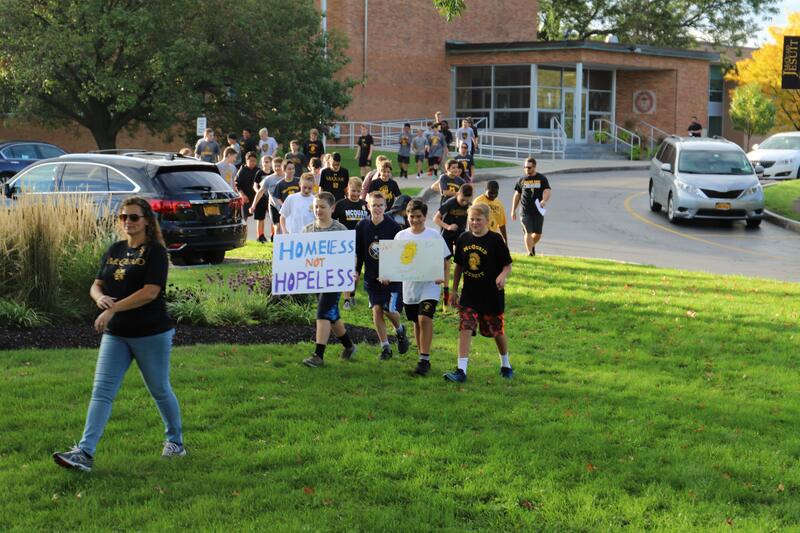 Begun in October 2015, the Walk for Justice is an annual Middle School event that raises awareness around the issue of homelessness. 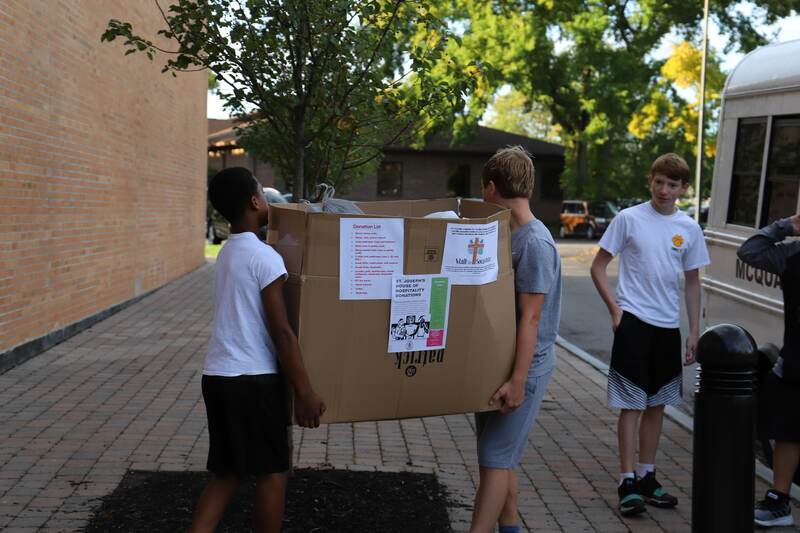 Middle School students raise money and collect supplies for St. Joseph’s House of Hospitality, a local Catholic Worker house that serves the poor, homeless, and needy of Rochester. 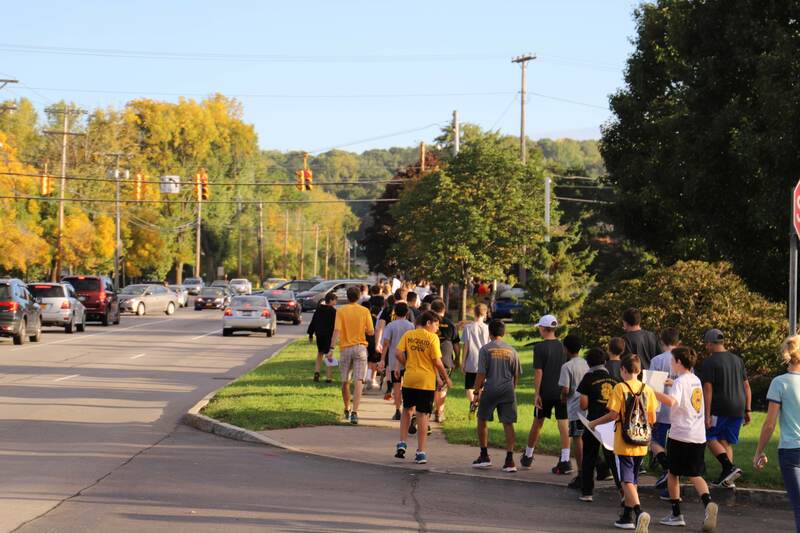 Students walk from McQuaid Jesuit to St. Joe’s where they celebrate Mass with men and women affected by homelessness. You can see some pictures from the most recent Walk, held on October 10th, 2018, in the photo gallery above. 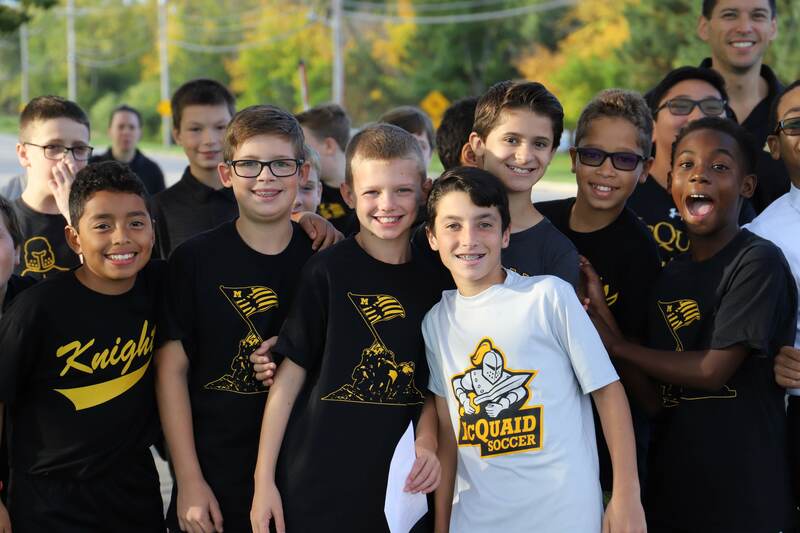 The Knights for Life are McQuaid Jesuit’s focal point for all life issues. The Catholic Church teaches that all human life is sacred from the moment of conception until natural death. To support this position, educate their peers, and promote advocacy, the group sponsors various events for the school community. Previous work by the Knights for Life include the Break for Life Conference. This conference brought hundreds of students together to address a variety of life issues, including but not limited to abortion, capital punishment, the environment, poverty, migrant issues, and euthanasia. Founded by Riley Benner, ’16, the McQuaid Ballers is an innovative service program that has its roots in working to reduce the recidivism rate within the New York State Juvenile Detention system. The original goal of working with juveniles in detention was to assure that once a child left a correctional institution they would not reenter the system. Today, McQuaid Ballers partners with Hillside Family of Agencies here in Rochester but the goal of mentoring at-risk youth to help them stay out of the criminal justice system is still the same. 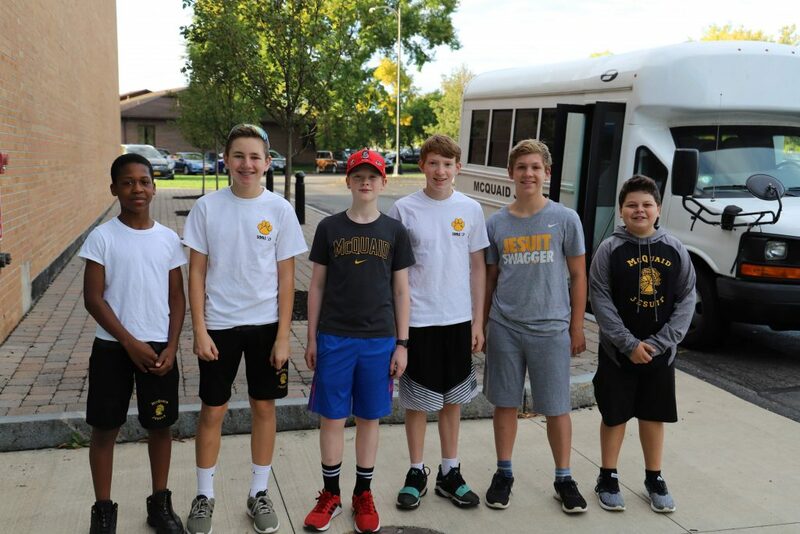 To achieve this goal, McQuaid Jesuit students commit to mentor juveniles on a weekly basis. Mentoring includes “balling” with the residents, sharing a meal, and discussing healthy life choices. By doing so, students “develop winning relationships” with the residents at Hillside. The St. Joseph of Arimathea Pall Bearer Ministry was founded in the spirit of St. Joseph of Arimathea who assisted with the burial of Jesus. Begun by Ian Gonzalez, ’16, the ministry was started with the core belief that no person should die without being prayed for or mourned. The seventh Corporal Work of Mercy clearly states we need to care for the dying and bury the dead. 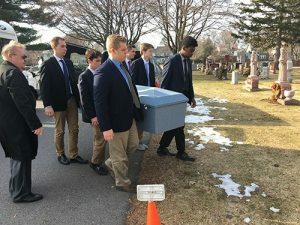 Currently, McQuaid Jesuit juniors and seniors serve as pall bearers at the funerals of veterans and/or persons who have experienced homelessness. Student pallbearers pledge to serve with respect and dignity. Students learn to offer sympathy and support to others and offer hope in the face of death. Before and after servin as pall bearers, students gather for prayer and reflection with a member of the faculty/staff. The ministry currently operates during normal school hours. For more information, contact Mr. Joseph Mulholland. The whole school takes part in our Thanksgiving Food Drive collecting canned goods to benefit House of Mercy and St. Joseph’s House of Hospitality. This past Thanksgiving we raised over 1,500 canned goods in support of these organizations! Some photos of students assisting with the 2017 drive are below. 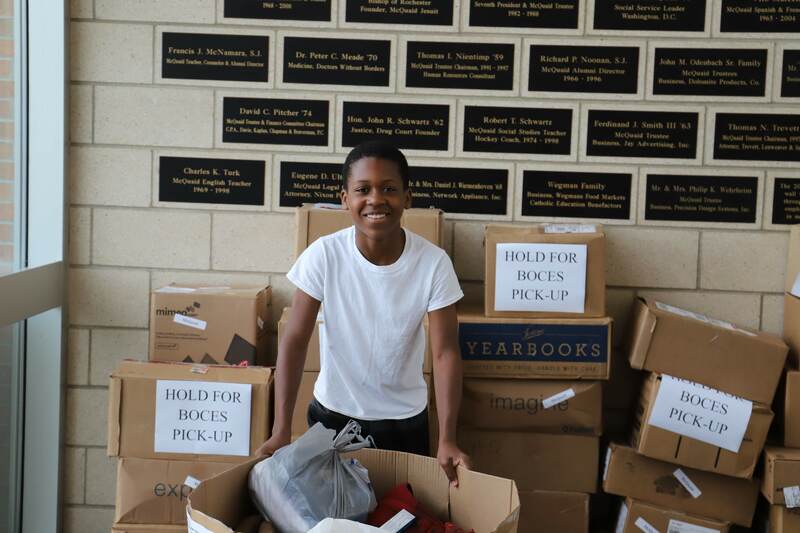 McQuaid gets in the Christmas spirit through our Christmas Blessings Project. Starting in early December, this project raises donations for some of the most needy members of the Rochester community. During the Lenten season the Middle School Campus Ministry participates in Catholic Relief Service’s (CRS) Rice Bowls program. Our students collect money to send to CRS to support its development programs across the globe.